Washington, D.C., May 11, 2016 — A new chapter on the Zika virus updates the latest edition of the “Control of Communicable Diseases Manual,” or “CCDM,” the leading sourcebook on identifying and controlling infectious disease. Available exclusively in a new online edition, the chapter identifies clinical features of the virus, including signs and symptoms of Zika virus infection and possible complications such as rare neurological effects and congenital birth defects. The chapter provides information about disease diagnosis, range of occurrence, incubation period, risk groups and modes of transmission such as via mosquito vector, intrauterine transmission and sexual transmission, among other documented routes. The text also includes guidance on preventing the spread of Zika, management of the patient and patient contacts, and reporting requirements. 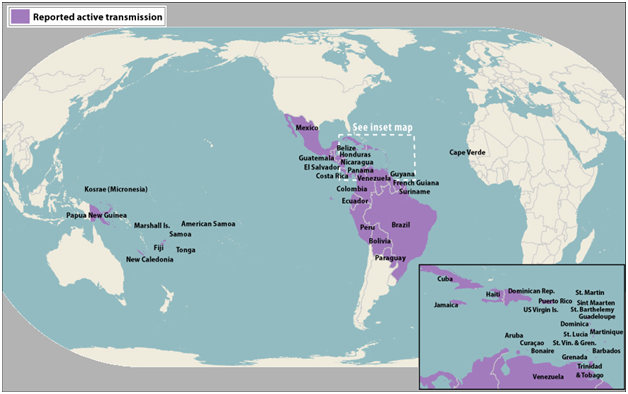 The Zika chapter updates the venerable reference book, which now contains key information about the occurrence, transmission and control of more than 130 infectious diseases globally. While the full manual is available in print and for mobile and Web, the Zika virus chapter is only available as part of the online subscription. The online subscription provides access to full text of chapters with links to references and resources. Digital subscribers have access to new and revised chapters as they become available; up to one-third of the book will be updated each year. An image and video bank will soon be added along with other dynamic content. Digital subscriptions are available for individuals and institutions. The Zika chapter was written for “CCDM” by Fernando Bozza, MD, PhD, of the Oswaldo Cruz Foundation, known as FIOCRUZ; and Ernesto T. Marques Jr., MD, PhD, of the University of Pittsburgh Graduate School of Public Health. Book ordering information: Published by APHA Press, “Control of Communicable Diseases Manual, 20th Edition,” ISBN: 978-0-87553-018-5, softcover, 786 pages, 2015. List price: $60, plus shipping and handling (APHA member price: $42). To order, call toll-free 888-320-APHA; fax 888-361-APHA; email apha@pbd.com or visit www.apha.org/ccdm. The new Zika chapter and subscriptions are available from the online platform. In the meantime, states have taken up the charge, with New Jersey being one of 40 states that prohibit e-cigarette sales to minors, according to a NovemberMorbidity and Mortality Weekly Report study of state laws from the Centers for Disease Control and Prevention. Thirty-six states will not sell to anyone younger than 18 and four states will not sell to anyone younger than 19.